My name is Susanne Clod Pedersen, I am a danish author and I write historical novels. I was born 1967, trained as a pianist and graduated from the Royal Danish Academy of Music as a soloist. I teach at the Musicology Institute at the University of Copenhagen and am the organist at Græsted Church and have four children. 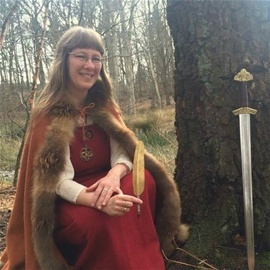 I am the author of two Viking novels, to medieval novels, a knight-trilogy and a Jesus-trilogy. Two of them became bestsellers. You are most welcome to look at my pages "Arnulf a Viking Saga" - "Knight Hialmar" - "Susanna's Book". Susanne Clod Pedersen has also written two plays and a book about how to play piano.